Thanks to innovations in manufacturing the look of stone is more widely available than ever before. Building Forward: In this series we are focusing on innovations in home design and improvement. From travertine backsplashes to river rock shower floors, continual innovation in manufacturing has made it possible to bring the look of stone into the home. These innovations have caught the attention of consumers and stone accents are popping everywhere including the backyard, thanks in part to a revolutionary company out of Orem, Utah. Seen here: SimTek’s Beige Granite. SimTek® Fence, founded in 2007, reinvented fence manufacturing with its patented design of rotationally-molded fence. The team at SimTek found themselves with access to an empty factory and idle equipment. Over time, they developed a variety of 25 product ideas that could take advantage of the available resources and finally found one unique concept, a realistic polyethylene stone panel that became an immediate hit. Not only was the final product beautiful in its replication of real stone, the new panels, made with a proprietary blend of virgin and recycled polyethylene plastic and reinforced with galvanized steel, were extremely durable. 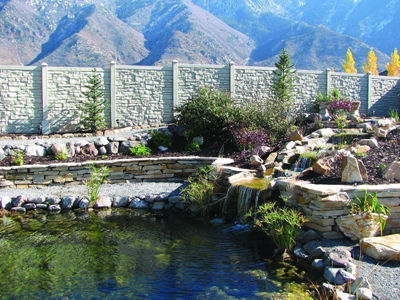 SimTek’s decorative rock walls have been tested to withstand constant hurricane winds of up to 110 MPH with gusts up to 130 MPH. Seen here: SimTek’s Gray Granite. And just like that the stone wall was back. 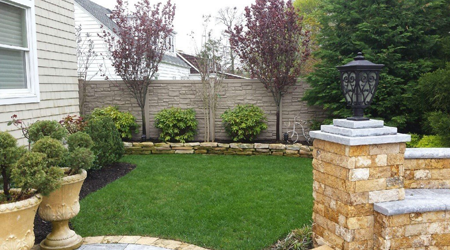 SimTek has since used the process to develop an equally lifelike wood-style fence, AshlandTM , but it was its original EcoStone® granite fence that helped bring the look of stone to the backyard. Ensuring that culture of innovation will continue to grow, SimTek was recently acquired by CertainTeed and will join our extensive fence collection which already boasts the industry’s widest range of styles, colors, and textures with the Bufftech® vinyl fence line. Combined CertainTeed Outdoor Living offers homeowners even more exterior design options. Do you have a stone fence? Let us know or better yet, share your pictures in the comments below. 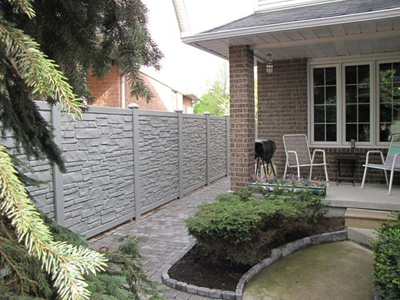 Want a stone fence for your backyard? We can help you find a qualified installer in your area. Plus, will that fence be doing double duty? We have the best options for keeping your pup safe while improving curb appeal.